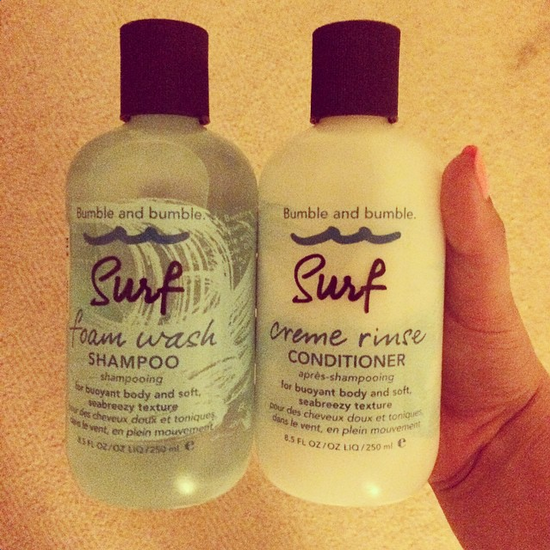 Beautiful You: Review | Bumble and Bumble Surf Shampoo & Conditioner! Review | Bumble and Bumble Surf Shampoo & Conditioner! A few weeks ago I went to a shop that we have in Swindon where you can get cosmetics at a reduced prices. I went a bit crazy when I saw that they had the Bumble and Bumble surf shampoo and conditioner in there as I have been wanting to try it for ages. As I have been loving it so much I thought that I would share that with you guys so that maybe you might try it! I'm going to do this review slightly different to how I normally do them because there is too much I want to say about this product! I think I'm just going to tell you my top 10 favourite things about this product to save you from having to read a huge long post. 1. A little goes a long way, when I bought these for £28.50 I was quite conscious of how small the bottles were and I thought that I would be going through these to quick to be spending that amount. However, they lather up so well that you literally only need a small amount of each and I have long hair (you should know this) and for me to say that really does mean something! 2. They smell amazing, I know this really isn't going to make you go out and try it but I love it when I've had a shower and my hair smells so nice and these do just that! 3. These do give your hair texture but I would say don't expect yourself to come out of the shower and look perfectly beachy like you've just come out of the sea. Obviously you have to use it along side a salt spray or something similar but it just gives your hair the extra dimension to work with. 4. Although these products don't claim to give 'volume' in itself, I have totally noticed the difference in volume of my hair. Normally as I have long hair it sits quite flat on my head unless I used my volume spray or a voluminous shampoo but this shampoo adds volume too so I use this and get too benefits for the price of one basically! 5. As this claims to give your hair texture, a lot of other products that claim to do the same cause my hair to get very dry, however this hasn't been a problem with this shampoo. Although I do use my moisture spray alongside but I do still see the texture! 6. You can get these in a mini set with the sea salt spray too which is brilliant for if you are going away or if you want to try the product before jumping in at the deep end and buying a full size version like I did. I may have to invest in one of these for when I go to New York next month. 7. You definitely do get your value for money, like I said a little goes a long way so don't be put off by the price tag because I think these will last me for a good while. I also don't use these everyday, maybe once or twice a week as then you can really notice the difference! 8. I find that as well as giving your hair texture it also makes your hair soft, the ends of my hair have just been bleached and this shampoo has been amazing at taking away any impurities and giving it the shine and texture that I want. 9. Whenever I use this shampoo and then curl my hair afterwards they always last so much longer and they are more defined compared to when I use my normal shampoo. It also makes a huge difference when you curl your hair the same day as washing it as I usually find that my hair is too clean to hold the curl but after using these this isn't a problem any more! 10. This is specific to these products but Bumble and Bumble have free delivery and free samples on all their orders, so if that isn't a reason to go and place an order I don't know what is! I hope you have enjoyed this review and I simply cannot recommend these products enough. My giveaway has ended now and I will get round to picking my winner at some point over the weekend so keep an eye out. I will see you all tomorrow for a blog post that is perfect for all those freshers amongst you so see you tomorrow!